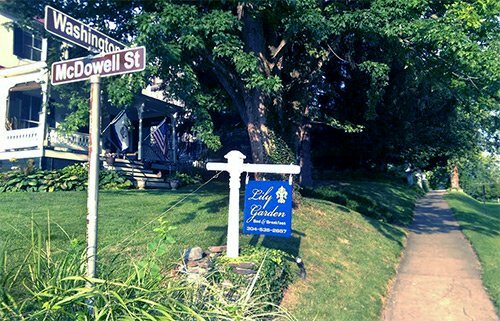 Lily Garden Bed & Breakfast is centrally located in the Historic District of Harpers Ferry, WV. With two private suites, we offer comfortable accommodations with numerous amenities for couples and families, as well as access to all the best parks, historic attractions, dining, shopping, and more. Lily Garden Bed & Breakfast offers peaceful, comfortable lodging in two private suites. The vacation apartments come complete with bed and breakfast amenities and plenty of indoor as well as outdoor space. The location is centrally located to the Harpers Ferry National Historic Park and a short train ride to the nation’s capital. We are pleased to welcome visitors from near and far who are looking for a great place to rest and relax. Are you planning to visit Washington, D.C. area? If so, consider bypassing hotels and motels to stay in our historic bed and breakfast in Harpers Ferry. Lily Garden Bed & Breakfast has two private suites: the Carriage House Suite and the Trundle Suite. The Carriage House has two bedrooms, including a sleeper loft, as well as a full bathroom, full kitchen, dining room table, living room, and is ideal for families and larger parties. The Trundle has a large bedroom, full bathroom and kitchenette, and is perfect for individuals and couples. Each suite has private entrances, and both offer access to our outdoor space. The shared yard includes a picnic table, covered swing, and water lily garden. There are also outstanding views of the Blue Ridge Mountains at the joining of the Potomac and Shenandoah Rivers. Bring your kids! Our B&B in Harpers Ferry is ideally located for a vast range of activities, sightseeing, dining and shopping options. 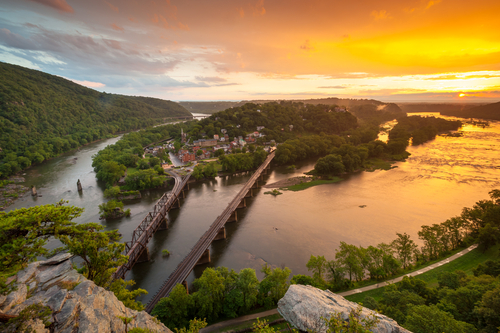 Harpers Ferry is home to numerous sites of importance in American history. The area around the town includes Civil War landmarks, hiking trails, natural wonders, vineyards, biking along the Chesapeake & Ohio Canal, the Appalachian Trail and so much more. Meanwhile, we’re an easy train ride away from Washington, D.C., as the MARC Brunswick line offers weekday access to all the great historic sites, monuments, and museums of our nation’s capital. We’re a charming, comfortable bed and breakfast located in the National Historic District of Harpers Ferry, WV. We have two private suites and can accommodate families, couples, and individuals. Our proximity to the Harpers Ferry National Historic Park, Appalachian Trail, Chesapeake and Ohio Canal National Historical Park (C&O Canal), Blue Ridge Mountains, Civil War landmarks, Jefferson Rock, and Washington, D.C. makes us a great spot for visitors to the area. Our homely amenities include a daily country breakfast, hot showers, Internet access, cable TV, and much more. Please visit our reservations calendar to book your stay. Nightly, weekend, weekly, and monthly rates are available. "Thoroughly enjoyed our stay. Loved the privacy and the comfort of the suite. Shawn took excellent care of us and offered wonderful recommend..."
"Lily Garden Bed & Breakfast is fantastic. It is beautiful, quite and peaceful. We came here for our anniversary and made promises to come ..."
"What a wonderful & homey place to stay! Our first trip to Harpers Ferry made so much more special by your cozy space. Really appreciate all ..."
"Perfect cabin, great breakfast, clean and charming. Shawn is wonderful." "Perfect size (Carriage House suite). Very comfy. Relaxing weekend for our 25th anniversary. Would love to come back."